Palate: Seductively rich and packed with peach, honey, and exotic fruit flavours. Power balanced with refreshing fruit is a hallmark of this site. Cellaring: With an abundance of primary fruit at bottling and a firm fine structure, expect this wine to fill out and become more generous over the next 3 years. Following this, more complex aromas will emerge and the wine should evolve and remain an engaging drop until at least 2025. A selective hand pick was made from our oldest vines, focussing on raising berries and noble rot bunches. Soaked overnight on skins before fermentation in small oak vessels, before bottling 3 months after harvest. In the 1990's, deep in the Waihopai Valley, Bryan and Jan Johnson established 320 acres of estate vineyards on land considered too hard, too dry and too unfertile for wine. It was a venture that started with a passion for the land. This pioneering spirit established one of New Zealand’s most successful boutique family-run wineries, now exporting eight varietals to 35 countries, from a crush capacity of 3000 tonnes. Today, Spy Valley’s commitment remains to the land and to the people who tend it, and their focus is on sustainability which will ensure the guardianship of this land for generations to come. 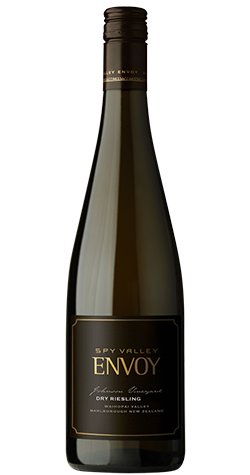 The name ‘Spy Valley’ comes from the wineries proximity to the spy base located down the road.